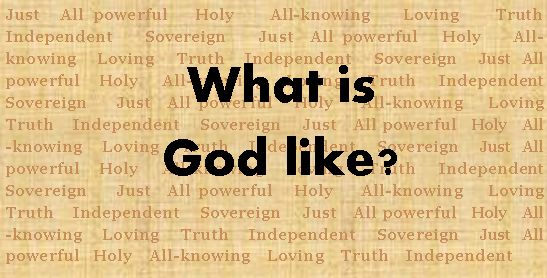 Theology for Kids: What is God Like? I’ve been discussing Theology for Kids by addressing 12 Questions to Get you Started. Research shows that many kids do not have a firm grasp on Christian theology, which makes them more vulnerable to tack on secular ideas and worldviews to their faith. As a result, we get young adults who aren’t sure if truth exists, can’t differentiate the Christian God from that of any other religion, are not sure if sin really matters, are skeptical about eternal punishment (aka hell), etc. As attributes are mentioned, be sure to discuss what they mean. This is important. A teen might be able to tell you that God is loving, but might understand ‘loving’ to mean ‘He’ll give you what you want’ or ‘As long as you are good you’ll get to go to heaven’ or ‘No one will get punished for anything’. This is not how God’s love is defined in the Bible. Here are some talking points to draw on as you discuss what the Bible says God is like with your kids. This is not exhaustive- making such a list would be exhausting. But I think this list represents some of the most important and central attributes. Let me know if you think I’ve missed something important. God is just – God judges our actions fairly and impartially (Ps 19:9). This should be both comforting and frightening. All wrongs will be judged and punished – those done against us and those that we did to others. Justice is how God will deal with all of us when we stand before Him. God is all powerful – Powerful enough to create the universe out of nothing. Powerful enough to raise the dead. This has limits though. He can’t make illogical things logical – like make 2+2=6. This characteristic works together with truth (e.g. the statement 2+2=6 is an untrue statement). God is holy – God cannot sin (it isn’t just that He doesn’t sin). He’s perfect. In A Survey of Bible Doctrine, Ryrie gives a great analogy of this. He asks: “What does it mean to be healthy? It means more than not being sick. Likewise, holiness is more than absence of sin [or evil]. ; it is a positive, healthy state of being right.” (p.19) Being holy like God is more than trying to figure out what not to do and what to do. It’s an attitude of the heart and the will. God is all-knowing – Nothing – not the past, nor the present or future – are hidden from Him. He also knows what might have happened, as well as the right thing to do in each circumstance. This, by the way, is a wonderful thing to remember. There is no sin that you will commit in the future that God did not already know about when He offered salvation to you. Don’t take advantage of it, but rather find comfort in it when and if you find yourself in the depths of that ugly sin. When tragedy happens, God knows about it and knows how it is affecting you and can walk beside you in it and work it out for His glory and your ultimate good. Remember, its not about you, but about God’s overarching plan. God knows what is best for us, even if we don’t feel its best for us at the time. When we know that He’s real and we know how the Bible has been created and passed down to us, we have to take Him at His word that He knows best and that the principles He lays out for us are trustworthy. Remember that He has the big, long-term picture in mind, we can’t see past the immediate. God is loving – Love isn’t just a feeling and warm fuzzies, it includes correction. All parents know that disciplining a child for his good is part of being a loving parent. God’s love isn’t just giving us what we want. Its working for our good even when that gets hard or messy or we don’t like it. God has the ultimate perspective and knows what is and what is not for our good (see the the all-knowing and holy characteristics). God is truth – God is true (Rom 3:4) and Jesus claimed to be the truth (John 14:6). What do we mean by truth? We mean that God is the absolute standard by which to judge everything. God’s perspective is unbiased and correct. It also means that He does not lie or misrepresent the truth. He is fully trustworthy. God is independent of and over all of creation – He makes His own choices from a free will. He was not obligated to save us from sin through Jesus. He answers to no one and no one has authority over Him. God is sovereign – Similar to the last point, God is the chief or the boss of everything. He’s the number one ruler of the universe. Nothing is out of His control and His will ultimately wins. One more important point: these attributes do not work in isolation; they are a package. It’s a great idea to illustrate this to your kids. For instance, a number of times I’ve seen people who oppose a moral or ethical teaching of Christianity justify their behaviour by appealing to God’s love. The argument seems to go: since God is loving, He would not condemn anything. He would just love people the way they are. This is overlooking God’s holiness, truth and justice attributes. The attributes of God all work together. This tension between the attributes of God is what resulted in Jesus death for our sins. We’ve said that God is holy and demands holiness from us. He also is just and demands justice. We know that we are not holy – all of us have sinned (Rom 3:23-24). And yet, God is love and loved us despite our circumstances. What’s a God to do? He could not overlook His holiness and justice – sin deserved punishment. But He loved us too much to leave us helpless. That is why Jesus – who hadn’t sinned – died for our sins. It satisfied God’s holiness (the penalty of sin needed to be paid for) and His loving nature (He didn’t want us to be condemned forever). BONUS: Now your job is even easier! William Lane Craig has written a great series of books called ‘What Is God Like?’. If your children are young (Berenstain Bears age), these are for you! What did I miss? Let me know what you think. ← How Is God Different From Your Child’s Imaginary Friend? Another excellent post. For Dr. Craig’s books (mentioned near the end), your readers can get a better deal at Amazon http://amzn.to/1u5AgSu The pricing there was about 20% less expensive.